Published in Idol Magazine, 2012. Original article here. 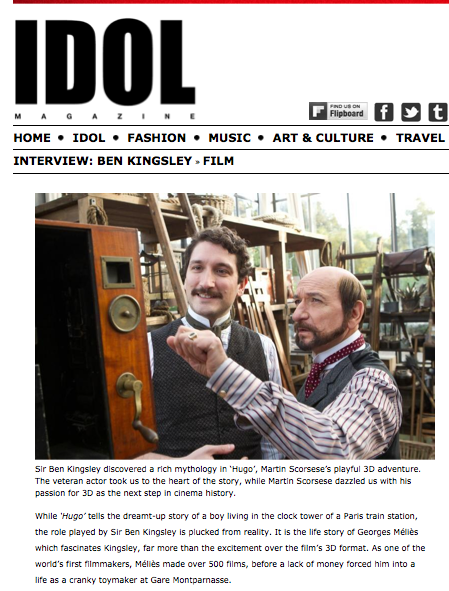 Sir Ben Kingsley discovered a rich mythology in ‘Hugo’, Martin Scorsese’s playful 3D adventure. The veteran actor took us to the heart of the story, while Martin Scorsese dazzled us with us his passion for 3D as the next step in cinema history. While ‘Hugo’ tells the dreamt-up story of a boy living in the clock tower of a Paris train station, the role played by Sir Ben Kingsley is plucked from reality. It is the life story of Georges Méliès which fascinates Kingsley, far more than the excitement over the film’s 3D format. As one of the world’s first filmmakers, Méliès made over 500 films, before a lack of money forced him into a life as a cranky toymaker at Gare Montparnasse. Kingsley paints pictures with his words. The veteran actor is calm and focused as we meet in grand settings at London’s Dorchester Hotel. Dressed in a dark blazer and neat jeans, Kingsley speaks with consideration, whispering a bit here and there for emphasis. Sir Ben, as he is called by everyone around him, is 67 years old, but there is nothing to suggest the ‘Gandhi’-star is looking for any less demanding roles now that he is eligible for his free bus pass. For what would be the fun in that? “I fear there is a desperate immaturity in me that means I will be stuck being a child for a long, long time,” laughs Kingsley. Kingsley shares the spotlight in ‘Hugo’ with 14-year-olds Asa Butterfield and Chloë Moretz, playing the parts of Hugo and his friend Isabelle. While the film, based on Brian Selznick’s book ’The Invention of Hugo Cabret’, is suitable for children, it contains a wealth of detail which means it appeals also to a mature audience. Children’s ability to inspire is a topic that Kingsley returns to several times during our meeting, both in terms of how it affects him as an actor, but also how it is the kids in ‘Hugo’ who inspire a change in filmmaker Méliès after he has given up. His background from the Royal Shakespeare Company means Kingsley is more familiar with the classical myths than most. This influence remains clear even now: Kingsley’s words are akin to performance, uttered with a perfect grammatical structure usually found only on stage. “I’ve always wanted to do something in 3D. Over the years I’ve been obsessed with it: the blue and red glasses, black and white 3D, I’m a fanatical about it all but I never thought we would be able to do it,” says Scorsese. Listening to Scorsese is fascinating: he charges forward, he stops mid-sentence and jumps back and forth as he makes his point. But all the actors in ‘Hugo’ say the same thing: Scorsese is highly observant, and he makes everyone around him feel at ease. Posted on 03/29/2012 by Jess. This entry was posted in Feature interviews. Bookmark the permalink.